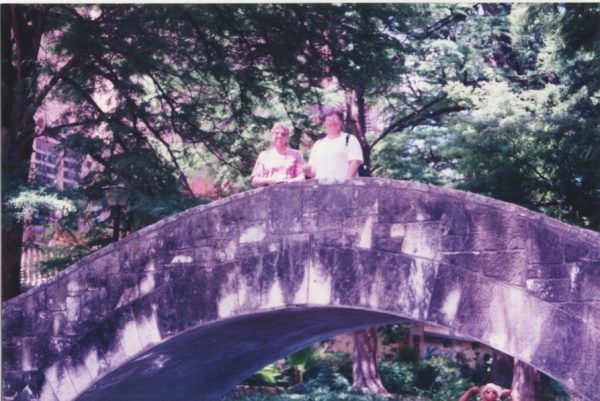 In 1996, my son was still living in San Antonio, Texas. He and his wife announced that they were pregnant, due in October, 1996. I decided to take a road trip to San Antonio from Atlanta so that I could take the bassinet that he slept in to use for his new baby. Donna, a friend since childhood, went with me. We left Atlanta early in the morning, headed for Texas. It took us two days to get there. Once we got there, we visited with my son and his wife. They lived in an apartment off base. My son took us on a tour of Lackland Air Force Base, showing us where he worked and some of the planes that were there. The next day, Donna and I went to Riverwalk, and went on the boat tour on the river. Yes, I wind up at Riverwalk every time I am in San Antonio. It is just a beautiful place, with lots of places to eat and spend time with friends and family. Here we are in a little street market in Nuevo Laredo, Mexico. We bought so many of those blankets! 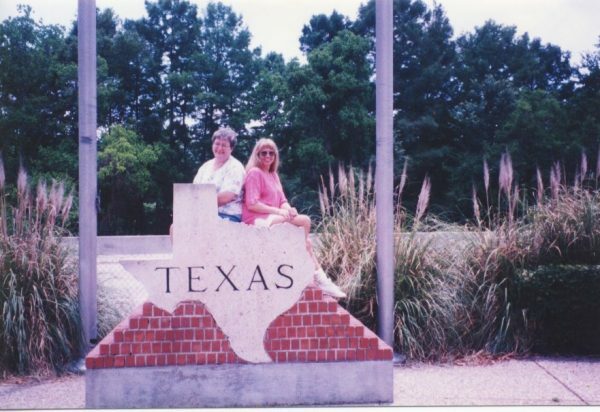 The before we left to go home, we decided to take a side trip to Laredo, Texas, so that we could visit Nuevo Laredo, Mexico. I love going across the border to Mexico and exploring all the little shops. The trip from San Antonio was about 160 miles from my son’s apartment. Donna and I decided to spend the night in Laredo so we would have plenty of time to shop. 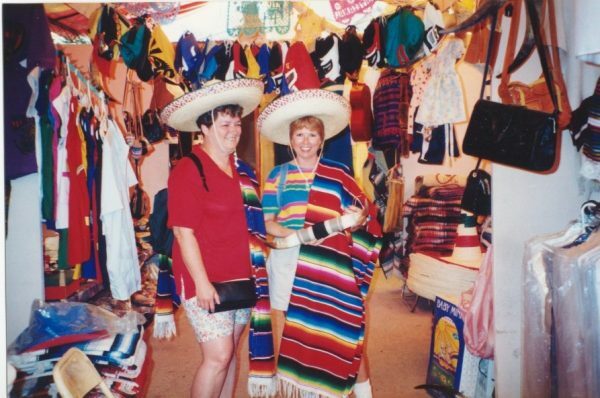 We bought about twenty of those Mexican blankets for $2 each (remember, this was in 1996). Donna bought a longhorn steer skull with horns so long that it barely fit in the back seat of the car. We named it Harry. While we were driving home to Georgia, with Harry on the top of all those blankets in the back seat, so many truck drivers honked their horns at us. It was a hoot! That road trip to San Antonio was one of the best trips I ever made.